There is a growing trend of global companies using International Transfers to meet their global staffing needs. In our recent blog post, Morgan Crosby (AIRINC, Vice President Americas) detailed the benefits of providing a potential transferee with easily digestible information about the financial impacts of such a proposed transfer. This type of personalized, up-front information about the value of the salary offer helps to enhance the employee experience and increases the likelihood of successful transfers. And doesn’t everyone want a transfer to be successful? Information presented in this form can be used by HR or hiring managers to supplement person to person briefings, or as part of an on-line self-service model, both simplifying and streamlining the process. Employee Perspective: What financial factors need to be considered? How does the salary being offered compare to current salary with respect to take-home pay? How far does take-home pay go in the new vs current location? 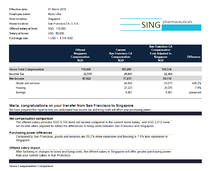 Sample Salary Evaluation Tool report. Click to download. 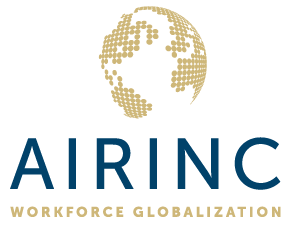 AIRINC’s Salary Evaluation Tool is specifically focused on making a financial comparison between what an employee has today versus what it costs to live in another place as a local. The tool produces a report in moments once the user enters the pre-transfer and post transfer salaries and family size. A benefit of the design is that it helps hiring managers knowledgably discuss the financials of a move, whether with the transferee or with other stakeholders involved in the move. In addition, AIRINC can design an employee-focused report format specific to your organization’s brand, which is accessed as a download option from the tool. This type of report can be directly shared with a candidate to help them understand exactly what the company is offering and how that will impact their standard of living.